Individuals para tafseers can be read or downloaded from here. Imam Ibn Kathir's full name was Abu’l-Fida’ Ismaa’eel ibn Katheer al-Dimashqi (d. 774 AH). 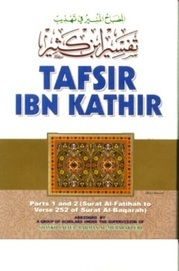 Ibn Kathir was renowned for his great memory regarding the sayings of Muhammad and the entire Qur'an. He was also known as a qadi, a master scholar of history, also a muhaddith and a mufassir (Qur'an commentator). Ibn Kathir saw himself as a Shafi'i scholar. This is indicated by two of his books, one of which was Tabaqaat ah-Shafa'iah, or The Categories of the Followers of Imam Shafi'i. The title of this tafseer is Tafseer al-Qur’aan il-‘Azeem. It is believed that this is the most commonly referred and used exegesis of the Noble Quran. Al-Suyooti (may Allaah have mercy on him) said concerning this Tafseer: Nothing like it has ever been written (Tadhkirat al-Huffaaz, p. 534). This Tafseer is based on commentary by quoting texts – verses and ahaadeeth. It is written in an excellent and easy style which is neither longwinded and boring, nor too short. He explains verses by quoting other verses and the ahadith that have been narrated on the same topic as the verse. Muhammad ibn Ja’far al-Kataani said about this tafseer: It is full of ahaadeeth and reports with the isnaads of those who narrated them and discussion of how sound or weak they are (Al-Risaalah al-Mustatrafah, p. 195). For the ahadith, he quotes the isnaads of some, especially those that were narrated by Imam Ahmad in his Musnad, as he is one of those who memorized al-Musnad. Imam Ibn Al-Kathir also discusses the soundness and weakness of the ahaadeeth in most cases, which is one of the important feature of his Tafseer. In this book, he has also quoted the views of the salaf, including the Sahaabah and Taabi’een, while giving an indication about the opinions and interpretations that he considers to be more sound than the others. While doing so, he has avoided odd dissenting opinions.